How to compare apples and oranges? We often heard clients wonder how to unravel different proposition that all looked the same at first glance. Some organisations want to implement a digital signage project but they don’t have all the information they need to do so and how to evaluate it. Sometimes the sentence “I’m lost there are so many propositions and they are so different from one another!” is heard. We sometimes see buyers compare a domestic screen price which is not guaranteed in a commercial environment to a screen conceived to operate 24 hours a day during 5 years. 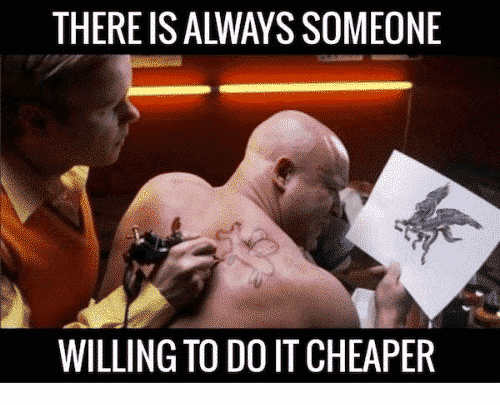 Or even not take under consideration the quality and frequency of the support service, the technical support, the software features and the monthly fees. Often in the past for public invitations for tenders and even for tenders from private organisations that solicit proposals to implement a digital signage network, we would only look at the price. More and more we see some evaluations grids including 4 to 8 criteria. Depending on every organisation’s needs, different departments representatives can participate in the proposition analysis; not only the accounts department! Weights like this allow you to get the best value for money; to get what you paid for. With this kind of evaluation grid, we can even distinguish apples and oranges. Interactive kiosk “Live Harvesting”: VIF Tele wins a Global Digital Signage Award 2019, an international prize. 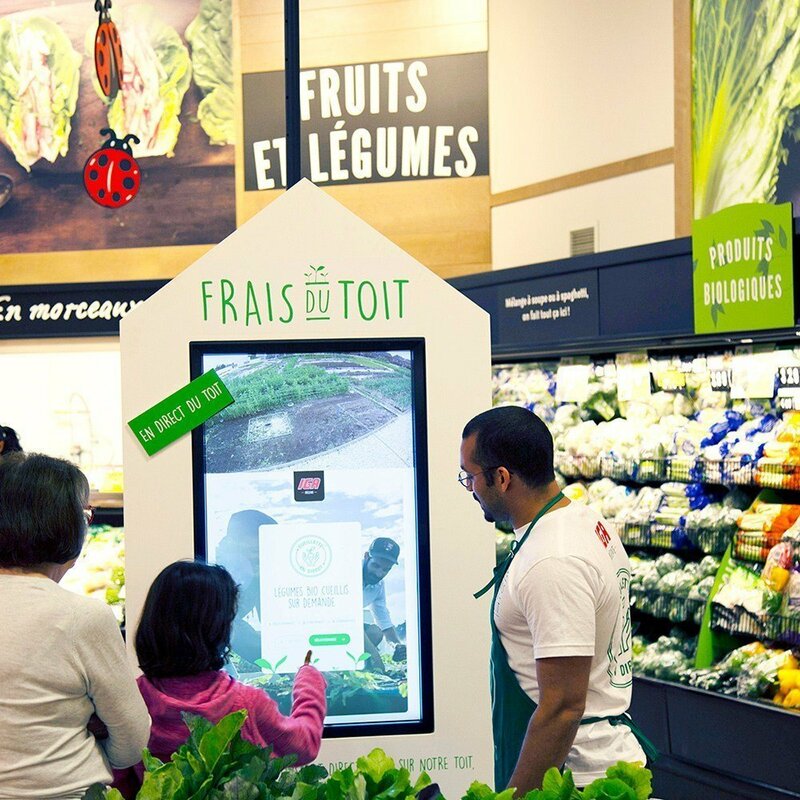 Last summer, for the “Live Harvesting” project at IGA Duchemin in Ville Saint-Laurent, an interactive kiosk allowed the supermarket’s customers to see and order their own organic vegetables. These were harvested live from the garden on the rooftop of the store. Through this interactive kiosk, after ordering, customers could see a gardener in real-time harvest their fresh vegetables. These were then delivered to the customers’ shopping cart before they even showed up at the check-out counter. For his part, the gardener had a “wifi” tablet allowing him to update daily the inventory of fresh vegetables ready to be harvested. This information was then being transmitted directly to the interactive kiosk so customers could decide which vegetables they wanted to order. In this case, digital technology enables the consumer to connect … with nature! The innovative aspect of bringing together different sources of content in one interactive kiosk to improve customers’ experience was regognized by the jury composed of 28 digital signage professionals from 9 countries. For this project, VIF Tele acted as the operator-integrator collaborating with IGA Duchemin’s family, Sobeys’ marketing team, Cartier Communications’ agency and Deux-huit huit firm. VIF Tele is a Digital Signage Opeator-integrator offering efficient, easy-to-operate and affordable turnkey systems. Founded in 2005, VIF Tele now has clients in Canada, in the United-States and in Europe. VIF Tele now has clients in France and in the United States! Our content management system Intenso is now implemented on screens in restaurants in France and in the United States. Our first clients outside of Canada! Since their implementation, Copper Branch restaurants use VIF Tele’s system for their digital menus boards. This vegan restaurant chain founded in Montréal is in constant expansion and now extends beyond Canada’s borders. During the past few days, restaurants opened in Fort Lauderdale, Florida and in Brest, France. Other openings are planned in those countries and in Canada in the upcoming months. In France, as required by our customer, each franchisee can easily modify the content and prices displayed on its screens via a secure web access. An other few hundred of VIF Tele customers in Canada already benefit from this feature. Thanks to our content management system, they can edit daily their menu displayed on their screens. The content management system Intenso was developped according to the standards and practices taught at ÉTS (École de Technologie Supérieure de Montréal). It is known for its simplicity of use and its inexpensiveness. The Live Harvesting/Frais du toit project of IGA Duchemin is a finalist in an international competition: The Global Digital Signage Awards. The innovative project Live Harvesting/Frais du toit at IGA Duchemin of St-Laurent is a finalist at the Global Digital Signage Awards in Europe. The idea of setting up a vegetable garden on the rooftop of a supermarket was unique in North America. With the integration of different technologies, customers get to see the rooftop garden while they are shopping in the store. This allows them to choose their own vegetables from the garden by using a touch screen at the interactive kiosk which is an innovation of international caliber! As an operator-integrator @VIF Télé collaborated with @IGA in particular @IGA vive la bouffe, @sobeys, @cart1er and @deuxhuithuit to integrate various softwares, equipments and contents from different sources on a single interactive kiosk. A live camera on the rooftop, an educational video and a touch screen to order on an ‘online’ website are elements set up to improve customers’ experience. It allows them to choose their organic vegetables grown on the rooftop of the supermarket. This way, they get them fresh in their cart before they even get to the cashier! The winners of the Digital Signage Awards will be announced in February during a ceremony held in Amsterdam. The grocery store IGA Famille Duchemin, in the Saint-Laurent borough, has a rooftop garden where it grows its own organic fruits and vegetables. Customers can see the urban oasis from a live camera and select on an interactive kiosk the produce they want, delivered in their shopping cart before the checkout! VIF Tele was operator/integrator for this digital interactive project, in collaboration with Sobeys, Cart1er Communication and Agence 288. One of our latest digital achievements for IGA – Sobeys receives a very laudatory comment. Our technical support service solves 95% of incidents in the required time! Digital Signage is admittedly a contemporary and innovative way to communicate and improve the experience in your environment. As lovely, efficient and impressive your on-screen content might be, when a technical/technological problem happens at the approach of your busier hour, a prompt solution is essential! Mid-January, just following the madness of the Holiday shopping, retailers from around the world gather in New-York for the National Retail Federation (NRF) Big Show and EXPO, #nrf2018. The Nemaska Lithium mining company choose the Intenso software for its internal Digital Signage. Just in time for the beginning of the new snow sports season, ski resorts from Les Sommets group, in the Laurentides and Outaouais regions, added a touch of freshness in their restaurants! They gave a boost to their menus’ presentation by highlighting their products with the Digital Menus provide by VIF Télé.